Spring is a great time of year to fly fish in Southwest Colorado. Our world class tailwaters provide year-round fishing opportunities and offer some of the best fishing of the year during the early season from March through May. Anglers can enjoy good flows and water temperatures, consistent hatches, and low visitor numbers during spring. As the weather warms, water temperatures will get up above 40 degrees, which increases insect activity and gets the fish moving. The Uncompahgre River at Pa-Co-Chu-Puk (Paco) is the tailwater section below Ridgway Reservoir. This is a quality tailwater with trout pushing 10 pounds or more. The flow at Paco during this time of year typically ranges from about 100 cfs to 400 cfs, as the release from the reservoir is ramped up from early March through mid-May. These flows and conditions provide for easy access and the ability to sight fish for trophy trout. Hatches during this time include small midges and Blue-Winged Olives (BWOs), along with caddis as the weather warms. As flows increase, fish will spread out more and hold in the current as well as the slower, deeper runs. Trout will also be less spooky, providing anglers with an opportunity to get in close and more easily target fish. Nypmhing is the most productive technique, and a longer fly rod in the 9’ to 10’ range allows for greater reach and easy mending for better drifts. Fishing small flies in size 20 to 26 with 5x and 6x fluorocarbon is the recommended approach. Matt McCannel, RIGS head fishing guide, says, “The top reasons to head to Paco in spring include consistent flows and excellent water clarity. There are also fewer anglers on the river.” For good fly patterns, Matt recommends Black Killer Mayflies size 24, CDC Emerger Baetis size 22-24, Barr BWO Emerger size 20, Dorsey’s Top Secret Midge size 20-22, Tailwater Tiny Olive size 20, Foam Back Emerger Chocolate size 22. For dry flies, Matt likes Eric’s Midge size 22 and Brooks Sprout Baetis size 20. In addition, Matt likes to throw leeches at Paco year round. Good leech patterns include Mayer’s Mini Leech size 16 and Hot Head Squirrel Leech size 10 in both brown and natural. The section of the Gunnison River from Pleasure Park upriver about 4 miles to the confluence with the Smith Fork can really light up during the early season. It’s a beautiful stretch of river that twists its way through sandstone cliffs. Flows on this stretch range from about 600 cfs to 1,500 cfs from early March through mid-May, before flows are increased through the Black Canyon. These flows and conditions allow for easy walk-wade fishing the entire stretch of river. This is a great time of year to jump on some early season dry fly fishing. The major hatches include BWOs and caddis, with the peak of the BWO hatch occurring during April. Caddis will hatch from late April through May. These hatches typically occur during the afternoon from about 1 PM on. Nymphing will be most productive in the mornings before the hatch. A 9’ 6” 5-weight fly rod is a good choice for the Gunnison, along with 9’ 5x leaders for flies in size 14 to 20. Matt loves to fish the Gunnison this time of year, and says, “The April BWO hatch is something you don’t want to miss!” Matt’s recommended fly patterns for the hatch include Brooks Sprout Baetis size 20, Morrish’s May Day BWO size 18, Extended Body BWO size 20, Crime Scene Caddis size 16, Matthew’s X-Caddis Brown size 16, and Caddis Variant Ginger size 14. Our area is arguably the most beautiful part of Colorado with some of the best tailwater fishing in the country. This is truly a great time of year to be here and chase big trout. Our top fly fishing trips during spring include walk-wade trips at Paco, and a special sight-fishing trip at Paco with Matt McCannel, and walk-wade trips on the Gunnison River at Pleasure Park. 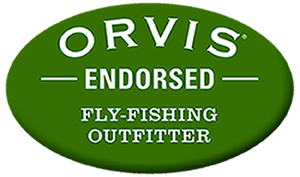 Contact the RIGS fly shop for the latest on fishing conditions and to book your spring fly fishing trip. Visit Ouray County this Spring or Early Summer! The perfect family trip to enjoy the beauty of the area. As each day warms to greet the coming summer, more activities become available and some of them are at their best. If you haven’t experienced Ouray County on a shoulder season, you don’t know what you are missing. Perhaps it’s time to change that? Need some inspiration? Check out some top reasons to come to the area in spring and early summer! The majority of tourists’ head to Southwest Colorado’s Ouray County to adventure late June through August; that doesn’t mean there aren’t other amazing times of year! In spring, the majestic San Juan and Cimarron Mountains still have a scenic blanket of snow over them as early runoff fills the Uncompahgre, San Miguel and Gunnison Rivers. Beat the crowds this year and experience a whole new Ouray County! Feel like a local- Beat the crowds and get to know what locals love about the area. Early season offers an amazing way to miss the summer crowds but still experience some of the best Ouray County has to offer. Prices- In peak season the area’s lodges are heavily booked and nightly rates are at their height. However, if you come early in the season you can get better deals on rates. Small Town Flavor- Don’t be shocked when you find that area restaurants make you want to come back just to have that special something that no one else in Denver is making. Outdoor Activities– Ouray County has a gamut of fun ways to experience nature. Mountains, camping, rivers, canyons, lakes, hiking, biking, jeep/atv trails and hot springs; all in one small region you’ll find the most diverse options in the shortest distance. There are so many great times to Fly Fish Southwest Colorado, however, late spring is often overlooked by many anglers because of runoff. Although some rivers are affected during Spring; the Gunnison Gorge (Gold Metal) and Uncompahgre River(Blue Ribbon) still offer tremendous fishing experiences in spring that should not be missed. Warming Water Temperatures- The fish are more active and so are the bugs. Trout metabolism is higher with warmer weather and the fish are hungry! Though we fish year round in Ridgway, fishing in 60 degree days can be more comfortable. Hatches- Stone Fly and Caddis Hatches. Though the water clarity may not always be “perfect”, fish are consuming a significant portion of their diet this time of year. That means if you can suspend your idea that crystal clear waters are the only way to fish -you can have some of the best fishing of your life hunting fish early season! Less people. When you’re on the river it is always nice to have some space. Visiting early helps you avoid the crowds and focus on what’s really important; catching fish and your technique with the help of a guide or just plain relaxation; find your happy place before everyone else does. There’s something about the Lower Gunnison River in the Gunnison Gorge National Conservation Area, an almost out of this world feel to it. It is both desolate and full of life, forcing us to question our senses. The history of the area alone is enough to overwhelm with archeological sites dating back before the Pyramids. It holds a special place in our hearts here at RIGS. The world-class Gold Medals Waters of the Gunnison act as the pulse of the area; home to thousands of trout. Not just trout, but big beautiful brown and rainbow trout, many of them well over 18 inches. While this incredible fishery may leave you aching to wet a line, the mastery of these waters requires a deep knowledge and patience to understand. Our guides’ passion for the Gunnison River often borders on obsession, with guides eagerly anticipating when they will return to the river that only a special few get to experience. The best way to experience the Lower Gunnison and Gunnison Gorge is by boat, allowing our clients to access miles of secluded water teeming with fish. The Lower Gunnison River is fish-able and floatable year round. The river fishes best April through October. Spring, Summer and Fall is the time of the dry fly. Caddis, Stone, May Flies and Hoppers dominate the river throughout the summer months. The River is best fished from a drift boat; this allows you to fish areas you don’t have a chance to get at from the bank. Our drift boats are the perfect way to experience comfort with their state of the art ultralight technology that gets our clients into the best locations with little to noise to disturb the fish. Overnight Drift Boat trips offer a great way to experience the real beauty of the Lower Gunnison River. What takes the experience on the Lower Gunnison to the next level is our guides. RIGS guides are a passionate, dedicated and patient lot of true teachers. Their ability to get new anglers into fish as well as challenge experienced anglers is what we specialize in. Below is a glimpse of some of the best guides in the region and RIGS top guides. Matt McCannel, RIGS Head Guide, has been guiding in the Gorge for 13 years. On average he spends 80 days out of each year guiding on the Gunnison River. He will do just about anything to get his clients into fish; his relentless enthusiasm is his driving force. Jeff McKenna has been guiding in Colorado for 7 years. He describes his passion for the Gunnison best in his words, “the Lower Gunnison is such a special section of river. It contains so much fishing opportunity and versatility as it winds through such beautiful canyons. The deep pools, small riffles and bigger runs provide the angler with not only fishing challenges, but logistic challenges that demand a strong-willed angler. That’s few of the reasons I love the ‘Lower G’”. Chance Harris has been immersed in the outdoors from a very young age. Hunting and fishing are a part of who he is, his ability to adapt to changing conditions, his patience and his willingness to share his passion for fishing with others are some of the qualities that make him such a great guide. Since the beginning of our involvement in tenkara in 2010, we have attempted to create alternatives and options that fit what we were looking to get out of this type of tool, with lines alternatives, fly deviations and pushing where it can work, creating a lot of fun for our clients and ourselves. Book at trip with RIGS to learn more about tenkara and nontraditional approaches to tenkara. Enjoy the read! Lefty gives a (conventional, not tenkara) casting demonstration to a group including former Maryland governor Martin O’Malley at the dedication of the Lefty Kreh Fishing trail (photo: Jay Baker). Last July at the International Fly Tackle Dealer show I had the chance to sit down with Lefty Kreh and talk tenkara. Visiting with Lefty is one of the great experiences in fly fishing. Despite all of his notoriety, he is generous with his time and a very entertaining raconteur. His wealth and breadth of fly fishing history and knowledge are astonishing. As I sat chatting about tenkara with him, I was struck by his genuine interest in the method and how he sees it in the larger fly fishing world. We talked a bit about how tenkara has been both marketed and portrayed and it was clear that he doesn’t have a lot of patience with the “one fly only” crowd, a position we have in common. He suggested that the notion that a tenkara rod and one fly was always going to bring about a satisfying fly fishing experience was overblown. “If someone buys one tenkara rod, uses only one fly, and doesn’t catch fish — they are going to be disappointed. Tenkara is a technique; you have to learn a procedure or technique and use it properly,” Kreh said. He also was concerned that the tenkara style of fly fishing not be oversold. He pointed out there are limitations with tenkara, just as there are with any other type of fishing gear or approach. We all know it makes no sense to fish for brook trout in mountain streams with a Spey rod. Paul Vertrees started his tenkara guiding career here at RIGS Fly Shop in 2012, traveling each summer to the Western Slope to guide tenkara trips on our regional waters. He became an active voice in the tenkara community throughout Colorado, representing RIGS with talks at the Denver Fly Fishing Show, Zen Fly Fishing Tenkara Winter Series and Backcountry Hunters and Anglers. With the goal of expanding peoples understanding of the beautiful simplicity of tenkara and how perfectly it works in our region, he furthered his guiding experience over the next three years in the Uncompahgre Wilderness. He was an instrumental piece in our Tenkara Weekend Getaway series and the exploration of our backcountry tenkara trips. We were blessed to have such an interesting character that is truly dedicated to the sport as well as the backcountry. We wish Paul all the best in his new guiding endeavors a little closer to home. Thank you Paul for your solid presence as a voice in our shop, as a guide and as a fellow angler. You will be missed.